The Rite of Christian Initiation of Adults (RCIA) is a program for non-Catholic persons who want to explore the possibility of becoming members of the Roman Catholic Church. It is open to persons who have never been baptized and who now desire to be baptized Catholic, and to persons who have already been baptized in another Christian tradition and who now wish to be initiated fully into the Catholic community. 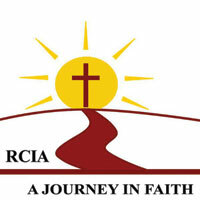 The RCIA program involves weekly meetings beginning in the early Fall and continuing through the following Spring. The program includes formal instruction in the teachings and traditions of the Catholic Church, activities to help the person deepen his or her relationship with God, and other activities meant to incorporate the individual into the Catholic community. Beginning the process does not oblige one to complete it. Persons interested in learning more about the RCIA program and parishioners who want to assist those persons who are participating in the RCIA program should contact Michele McHale-Pickard, Carl McColman, or Fran McColman by phone at 404-378-4588, or by email at rcia@stmga.org. 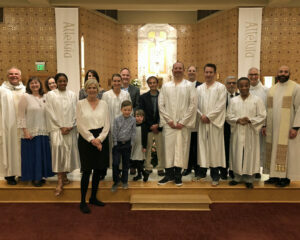 Four adults, one teenager, and two children received the Sacraments of Initiation at the Easter Vigil on Saturday, March 31. 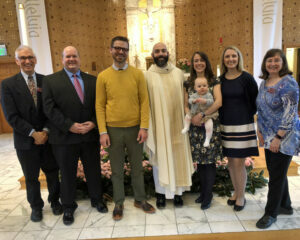 Delaney Blackshear, Christopher Brodnax, Ben Moore, Albert Reynolds, Julie Stewart, and Julie’s children, Ian and Eva Stewart, were baptized; and all except for Ian and Eva were also confirmed and received their first communion. On April 8, Nick Bolton and Erica Jones were confirmed and received their first communion, entering full communion with the Catholic Church after having been baptized in other Christian communities. In the weeks to come, three more adults are scheduled to enter into full communion with the Church as well: Paul Roeser and Heather Radlmann on April 29, and Andrew Roberts on May 13. These joyful celebrations come after these adults have learned about our Catholic faith through the RCIA Process. If you or someone you love is interested in learning more about Catholicism and is considering becoming a Catholic, please reach out to our RCIA directors, Carl and Fran McColman, at rcia@stmga.org.